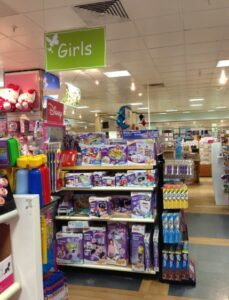 Fenwick stores have large ‘Girls’ and ‘Boys’ signs in their toy departments. We’ve written to explain why we think they should come down. Let Fenwick know what you think. You can find contacts for individual stores, or Tweet their flagship Newcastle store. Let Toys Be Toys is a grassroots campaign which represents thousands of customers who believe that toys should be marketed equally to boys and girls. Several customers have recently contacted us to express concerns about the way Fenwick displays toys in store. For example, a customer at your Newcastle store spoke to us about signs indicating that Doctor Who, science kits and dinosaurs are for ‘boys’. 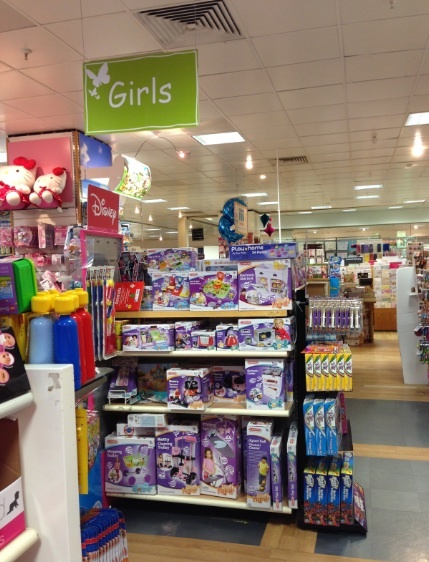 A Brent Cross customer also told us about large ‘boys’ and ‘girls’ signs (pictured below). Toys underneath the girls sign included dolls and toy domestic appliances. Signs such as these are extremely damaging to young children, telling them from an early age what is expected of them because of their gender. We have countless examples of children who refuse to buy from the ‘wrong’ aisle and parents who are utterly baffled by placement decisions by stores. With many little boys who love to play at cooking and girls who love dinosaurs, there is a significant market whose needs are not being catered for here. As a result of conversations with Let Toys Be Toys (and considerable consumer pressure), a number of major retailers have decided that marketing toys in this way is a thing of the past. Toys R Us, The Entertainer, Boots, Marks & Spencer, Tesco, Sainsbury’s and TK Maxx have all committed to phasing out sexist signs and making toy marketing more inclusive to boys and girls. As more retailers decide to modernise we believe there is significant financial and reputational risk in persisting with this approach. We would be delighted to discuss this further with you if possible. We openly celebrate inclusive marketing and have worked in conjunction with several retailers to make this happen. We can be contacted on the e-mail address above, and look forward to hearing from you.